If you have a dog at home then you may have seen that he/she has a tendency to scratch. Ever wondered why they scratch themselves so much? The incessant scratching is caused by parasites most commonly known as fleas and ticks. So how did your dog get fleas and ticks in the first place? These parasites were transferred through other pets carrying fleas or ticks or eggs or they came directly from the surrounding environment. Most often than not, fleas cause allergy and ever hair loss in dogs but ticks, which are parasitic arthropods, are quite capable of making your dog sick. So, what is the solution? 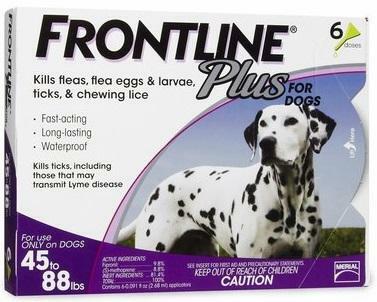 One of the best solutions that enables removal of both ticks and fleas is Frontline plus. Let's take a look at what it really is and how it can help your dog. Frontline Plus is a flea and tick preventative medication for dogs that is being manufactured by Merial, which is a multinational animal health company. Merial was recently acquired by Boehringer Ingelheim. It is one of the largest animal health companies in the world and was initially started as a joint venture between animal health subsidiaries belonging to Sanofi-Aventis (Rhône-Mérieux) and Merck & Co. (MSD AgVet). Merial focusses on producing several animal health products and vaccines and some of the most popular brands include Frontline, NexGard, Heartgard, PureVax, Previcox, and Ivomec. Benefits of using Frontline Plus? What Frontline plus does for dogs? Frontline plus is an over the counter (OTC) flea and tick control product for dogs. This medication is available in applicator form and is considered to be extremely fast acting. It is available in two types of packing, one for dogs weighing between 45-88lbs and another for cats weighing over 1.5lbs. It is also available for different weight groups in dog’s right from 5lbs to 132lbs. The product in question is focused on ticks and flea control in dogs weighing between 45-88lbs. It is quite a safe product for any dog weighing between 45-88lbs. Some dogs may be sensitive to a single or both ingredients of this topical product. Long-term exposure to Fipronil can lead to cancer although immediate side effects are quite rare. The only known side effects include temporary skin allergy and sometimes severe irritation around the site of application. There are two different ingredients used in the making of Frontline plus and they are fipronil and (S)-methoprene. Let's take a look at what these ingredients really are. Fipronil is basically an insecticide, which belongs to the phenylpyrazole chemical family. It is considered to be a slow-acting poison. This insecticide has the ability to block blocking GABA-gated chloride channels and glutamate-gated chloride (GluCl) channels in the central nervous system of insects and parasites thus resulting in nervous system toxicity. When used on cats and dogs, fipronil can virtually kill fleas hiding within a dog's coat in a matter of 24–48 hours. (S)-Methoprene or Methoprene is an insect growth regulator specially when used as an as an insecticide. It is also known as a juvenile hormone mimic. It does not kill parasite or insects. What it really does is interfere with the biological life cycle of the parasite and when ingested by insects or parasites it affects female fecundity. Thus it not only prevents growth or maturation but also prevents any further infestation. How to use Frontline Plus? Note: You need to apply the entire contents of a single applicator in a single spot only and it should be applied on the skin and not hair. Since, Frontline Plus is an insecticide, it has its pros and cons as well. Let’s take a quick look at them. Fipronil in Frontline Plus is highly effective against different types of ticks including American dog tick, brown dog tick, lone star tick and the infamous deer tick, the latter being a carrier of lyme disease. Research studies have proven that it can kill 100% of fleas almost 24 hours after application and also kill ticks within 48 hours of application. It is easily available as it is an Over-the-counter flea control product. It kills rapidly and continues working for almost 30 days post application. It is water resistant and easy to administer using an applicator that spreads the medicine directly into the dog’s coat. It is a topical medication that can be harmful to children. Fipronil in Frontline Plus is highly toxic to fish, bees, and aquatic invertebrates. 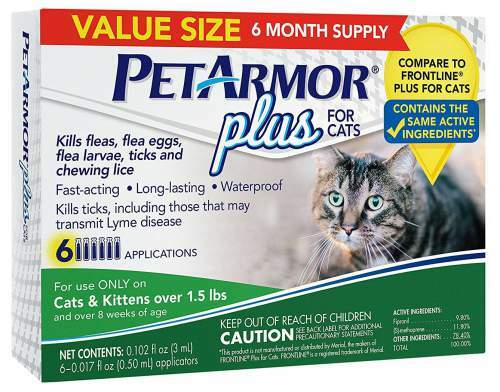 There are several different products available in the market that promises to be highly effective in killing fleas as well as ticks. Frontline is one such product. 100% effectiveness against adult fleas, ticks, and chewing lice. Overall, Capstar is one of the best flea medicine for dogs and cats which takes only 30 minutes to start working actively in getting rid of fleas on dogs and cats. ​If your dog spends most of his or her days scratching then it’s time to provide some relief. Scratching takes place due to flea and tick infestation and you need to kill these parasites as well as provide future protection. There are several different medications to choose from and Frontline Plus simply stands out. It is a topical solution, which means you don’t have to worry about running around the house trying to make your dog swallow tablets.